I have been having a hard time lately picking a food to highlight and then it hit, pumpkins. Perior to maybe a year or two ago I honestly thought pumpkins were only good for pie, their seeds and making wicked halloween decorations. It wasn’t until I learnt that you can cook and eat a pumpkin in a form other than pie and roasted seeds that I started to get a little more interested in what they had to offer. It being fall (or at least Starbucks has released their Pumpkin Spice Latte) I felt like it is the perfect time to dive into why these giant orange orbs are so good for you and explain why there is more to them than just making a delicious pie. 1. It is packed full of antioxidants. Antioxidants are great at fighting the signs of aging, but pumpkin also has a particular antioxidant that is great at helping your body to fight off the dreaded UV ray, so load up on the delicious squash. 2. High in B-complex vitamins. 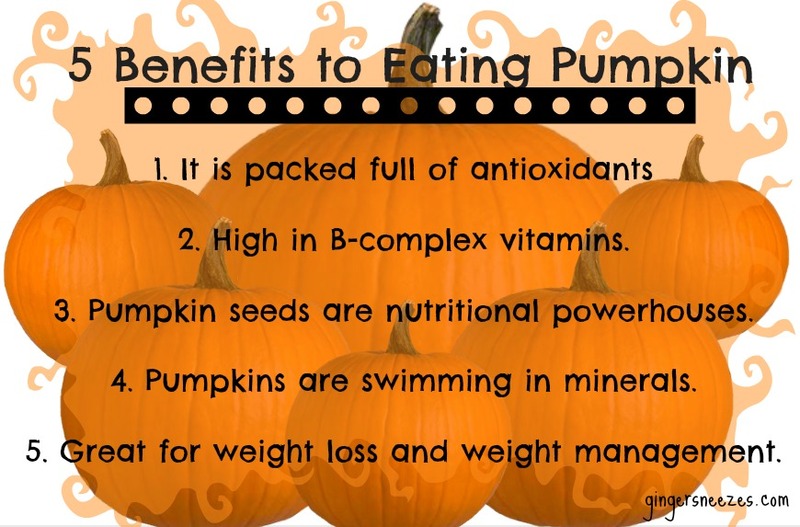 Pumpkins are jam packed with B-complex vitamins such as folates, niacin, vitamin B-6 ,and thiamin. B vitamins are so great because ????? 3. Pumpkin seeds are nutritional powerhouses. Maybe roasted pumpkin seeds is a favourit of yours every year after carving up a pumpkin, well these little guys are giving you a reason to eat them all year round. The tiny little seeds are packed with zinc, vitamin E, iron, and protein, so go ahead sprinkle them on your salad or top your yogurt with them. 4. Pumpkins are swimming in minerals. Minerals like calcium, potassium are found in the pumpkin flesh. For a 1 cup serving there is about 24 mg of calcium which although is not as high as something like cottage cheese or greek yogurt, it provides a nice calcium boost for those who might be trying to add a bit more into their diet. 5. Great for weight loss and weight management. As the weather cools off we all start reaching for heavier belly warming foods that it can sometimes be difficult to remember that the heavy cream based soup we at was super rich in calories. Pumpkins not only make a great “creamy” soup without the dairy they also only have about 26 calories for 100g serving. Next time you are looking for something to roast, puree, or mix into a stew think of pumpkin as a great addition. Pumpkins are so great I could probably keep going on and listing the host of vitamins, minerals, antioxidants, etc. forever, but these are my top five picks. I hope they give you a reason to pick up a pumpkin from your local farmer’s market and test out a new recipe this fall. Happy Friday everyone! I hope you all have wonderful weekends planned. This entry was posted in Food, General and tagged food, health, health benefit, mineral, pumpkin, pumpkin seed, top 5, vitamin by healingginger. Bookmark the permalink.